As you move from east to west across the U.S., accents lose their flavor, until you arrive to California and there’s no accent at all. Los Angelenos do, however, have a particular manner of speaking, especially those of us who grew up in the eighties. Like, you know, whatever. 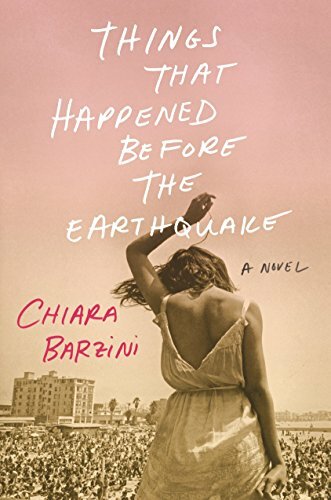 Valley Girl talk is mocked as often as it is emulated, and Italian writer-filmmaker Chiara Barzini captures this mixture of disdain and admiration for L.A.’s San Fernando Valley in her subtly brilliant debut novel Things That Happened Before the Quake. It begins in May 1992, just weeks after the policemen who beat Rodney King were acquitted, and Los Angeles exploded with riots. Over six days, 58 people were either shot, stabbed, or beaten to death. Two thousand were injured, 11 thousand were arrested, and over $1 billion of property was damaged. Barzini’s cold-eyed narrator is 15-year-old Eugenia, whose family moves from Rome to L.A. just after the riots end. As they drive from the airport to their new home, they “saw police choppers in the sky, metallic dragonflies emitting shafts of white beams moving probingly over the concrete below.” This ominous vision sets the tone for their stay in L.A., and the metaphor tells a reader that Barzini knows what she’s doing. But they don’t listen, and Eugenia enters Van Nuys High. Things have changed since Marilyn Monroe went there in 1941, and Eugenia’s classmates think she’s fleeing an oppressive third-world country; the idiots think Mussolini is still running Italy. The students are prohibited from wearing red or blue, because those are the gang colors of the Bloods and the Crips. They also can’t do any “C-walking,” which means any kind of jittery strutting. “We were to walk in straight lines and wear bland clothes.” Welcome to teenage life in ’90s L.A.
Eugenia spends winter break in Sicily and returns to find her father has turned their house into a film studio, with actors sleeping in bedrooms and her mother making Italian meals for the crew. It seems things can’t get any worse. But then Eugenia befriends a precocious girl named Deva, who lives way over in Topanga Canyon on a ramshackle property with her father, an alcoholic musician. Eugenia’s world changes when she comes home with Deva for the first time. It’s through similes like these that Barzini mythologizes the Valley of the ’90s, as well as her own adolescence. With her unpretentious yet stylized language she turns the mundane into something sacred. But that’s fitting, because despite our teenage years being terribly awkward, most of us look back on them with a vague awe, as we do when gazing at anything incomprehensible. And what’s more incomprehensible than when the earth itself undulates as if it were liquid? On January 17, 1994, a 6.7 earthquake struck the Valley. Eugenia’s house is crooked, but still standing. Yet it’s the final omen. Things don’t work out for Eugenia’s father’s film, or for her relationship with Deva, and the family moves back to Rome. But by then Eugenia understands what Max was talking about: She stops trying to grasp the golden magic of California, and simply feels it. The luminous unseen. If you don’t know what that means, you haven’t spent much time in L.A.